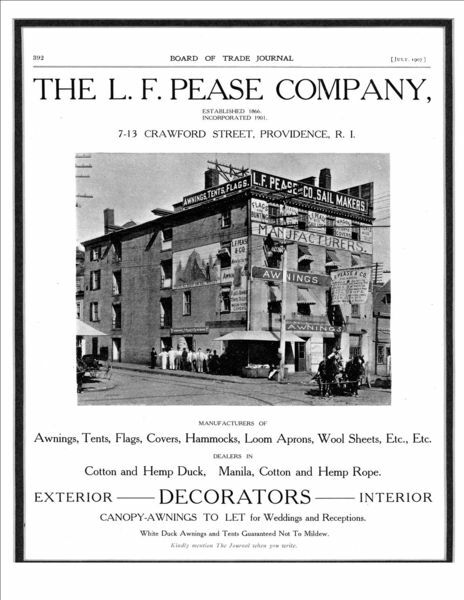 Pease Awning & Custom Products is the oldest established company in Rhode Island with its roots beginning before 1866 on Martha’s Vineyard as a Premier Sail Maker. Continuing with its success, put roots down in Providence and became famous as a craftsman manufacturer of sails, rope, tarps, awnings, tents, canopies and wagon horse covers. The older generation remembers the old joke about the women who had to wear a PEASE dress, (like a tent). We still love to hear the stories. Over the last century and a half, Pease Awning continues to evolve and change with the times. Decade after decade Pease Awning has the reputation of a high quality custom manufacturer that can create, build and install any type of Shade Product available on the market. We look forward to passing our knowledge to future generations and servicing your grandchildren as we serviced your grandparents. We also look forward to future inventions and will continue to strive to bring our customer’s the most current proven best quality products to fit your lifestyle.